Put some miles on the car this weekend – being careful with it so far, but so far so good. The engine seems at least as torquey at low revs as it was and I reckon that the cam is just beginning to do its stuff at the point that I am changing up at the moment. I really can’t wait to give it some stick and open her up. Still must wait! I drove up to near Warwick on Saturday night to meet up with some of the FriesianRacing herd and went out for a lovely meal at a local hostelry. Whilst there, Andrew dug out some sensible advice on the net from our friend Badger here. Worth a look if you are dong the same. Badger has lots of experience in rebuilding V8s and has a sensible approach to running in! Next steps are to sort out the rear diff which is showing some damage, buy some more shocks and source some tyres. 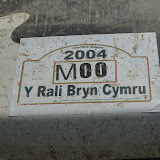 Then its off to the bodyshop for a tidy up followed by its new livery and the unveiling of our new sponsors for 2007! You’ll hear it here first! Last weekend saw the newly rebuilt engine fired up for the first time. There’s some video of the bedding in process of the cam on YouTube.